With each Part of the five parts in this series of Building and Testing your Minimum Viable Product (MVP), I will add a Results and Lessons Learned. I learned from a great friend, these are “Retrospectives” vs. “Post Mortems” because no one died! Day one results – YES! Made a sale of the “Financial Model Template – Subscription Model” for $99 to someone who wasn’t on my existing list. That’s a win. I should have listed that it was Part 1 of a 5 Part Series – foreshadowing is good. I posted the post on a Sunday – bad move. I should have scheduled it to be posted on a Tuesday, late AM, a time when people may actually read it vs. a weekend. It took more time than I planned setting up MailChimp Automation and integrating with SumoMe. MailChimp automation, the ability to send five scheduled emails in a row required me to move from “Forever Free” to pay as you go at $0.03 per email. Support from SumoMe was great. Thanks @noahkagan and @SumoMe team. 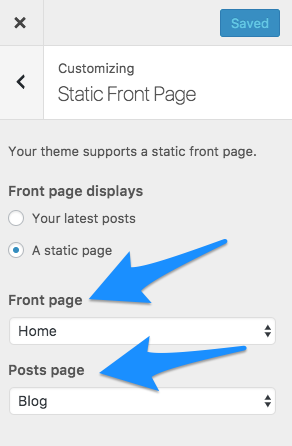 When you go to Customize Your Site on theDashboard there are two important settings. Set Front Page as Static – that means your homepage will stay the same vs. changing every time you post a blog post. I wrote and posted my second post, this time using the scheduling feature to launch Tuesday late AM! But I had to fix a setting on the “Customizing” (see image at right). I forgot to set that the lower text box wasn’t selected to “Blog” so though the first two blogs posts were live, but they were difficult to find because they weren’t on the Blog page … oops. I hadn’t yet set up automatic social sharing until I worked out the bugs – e.g. I wanted to get the 140 character Tweet right and have the right default image to share on Facebook. Determine your order of sharing and test it before you automate. Categories and Tags – make sure you add these before you post. The default Category will be Uncategorized. After you’ve made 100 posts you’ll want your reader to be able to find your themes… and it won’t hurt your SEO either. Finally, have an editor! I’m lucky for a lot of reasons on this one. My editor is my wife, Kathryn Parker, of 29 years (@StartupSpouse5). Someone should give your post fresh eyes.